JEFFERSON CITY, Mo. 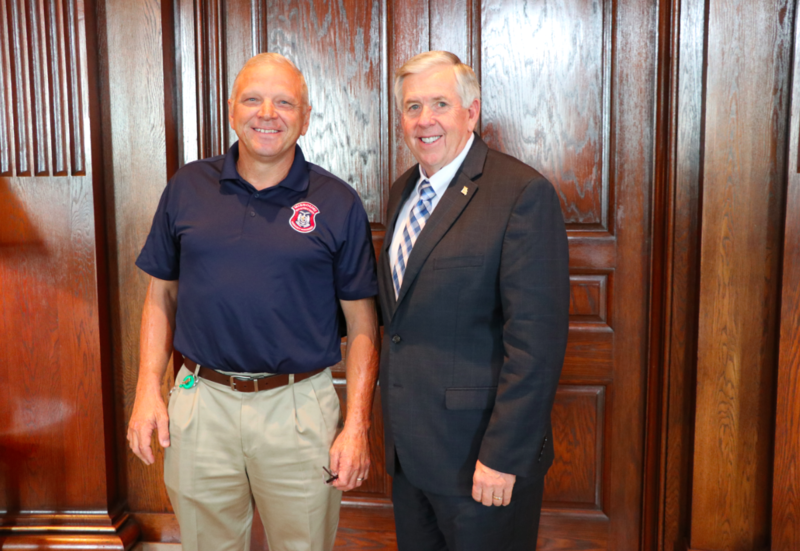 – Wednesday morning, Governor Mike Parson met with State Emergency Management Agency (SEMA) Director Ernie Rhodes, Department of Public Safety Director Drew Juden, and SEMA Chief of Operations Terry Cassil to thank Cassil for his service before his departure to Hilo, Hawaii. Cassil, who has been federally deployed to multiple disasters across the United States as a member of Missouri Task Force-1, has been assigned through the Emergency Management Assistance Compact (EMAC) and will serve as a Safety Officer. EMAC is implemented through the State Emergency Management Agencies, is an all hazards-all disciplines mutual aid compact, and serves as the cornerstone of the nation’s mutual aid system. This allows states to use mechanisms (intrastate law, intergovernmental agreements, memorandums of agreement or understanding, and governor executive order) to share resources within their state (from all jurisdictions) with other Member States. Recovery from the April severe storms, flooding, landslides, and mudslides in the City and County of Honolulu and Kaua’i County has been underway for months, and the need for assistance is still in high demand. As a Safety Officer, Cassil’s objective will be the safety of responders, reporting on July 20 and returning home August 2.